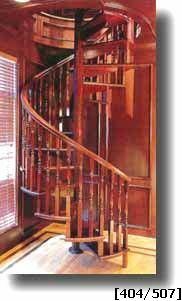 Classic Red Oak wooden spiral staircase creates a warm, traditional look in a contemporary setting. 64 inches in diameter, this spiral staircase is the smallest diameter available and meets all secondary access building codes. Steps, baluster, handrail and dimensions were chosen by the customer from our catalog and assembled in our plant. All our wooden staircases are shipped with unfinished wood to allow customers to match interior colors. Shipped in numbered crates and assembled on site for the safety of the materials.